Are the clients happy with their choice of marble for countertops? Thanks, Garrison. I have a remnant of beautiful honed carrara left over from a bathroom reno. I've got enough to replace the brushed black cambrian granite that's on all my countertops with white cabinetry. I'm thinking that the contrast with the marble on the island would be beautiful, but I'm concerned about losing durability. I don't use the island a lot for prep, but do put hot things from the oven on it. How well does marble withstand heat? Maybe I should hire you for a consult. I'm in Gresham. (hennef7@yahoo.com). Thanks again for your input. I think it's a great idea hennef7! But of course there are some things to think about. I'm going to send you an email. Sounds like you're off to a great start with the redo! 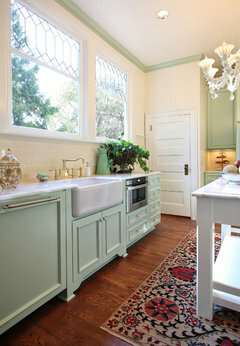 Beautiful cabinet color - what paint manufacturer and color is this? Not sure why the description of this particular stove states that it's "the cost of a small BMW".While the Chateau lines of La Cornue DO cost a small fortune, this is the less expensive model-I believe it's the 110, and runs around $7500 if you search. 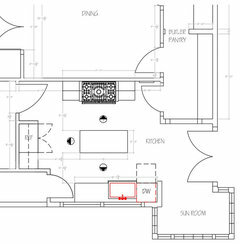 What are the dimensions of the kitchen and do you have additional images available from oer perspectives? - Just bought a home knowing we want to redo kitchen. LOVE this! Thanks so much, here are a few of the drawings that show dimensions. This is probably the loveliest kitchen I have ever seen. Can you please share the paint color palette? Also, are the cabinets painted with any sort of glaze or special treatment? Thank you! Where can I buy that range hood? - I am looking for a matching range hood for the Cornue Fe 110. Looks like yours is a perfect match! Are you able to share where and how much it was purchased for? We did a custom vent-a-hood. I specified the color of metal and accents, turned out great. Talk to your supplier of your appliances, should be easy for them to quote you. Blowers are rated by CFM – that is, how much air they move, and the requirement is based on the stove top you have. The more heat produced the bigger the blower you need. Check with the manufacturer of your stove for their recommendations as well as your local code requirements. A general guide is: for every 10,000 BTUs your cooktop produces, you need 100 CFM. For example, a cooktop producing 90,000 BTUs would need a 900 CFM unit. Verify this with your supplier before getting additional quotes. is it an interior, recirculating hood? What color of pain are these blue cabinets? subway tile - what color is the subway tile? where can i find it? thank you! I love the cabinet colors! Thanks so much. We used Sonoma's - Tribeca style, in the color - Butter. Love the slight crackle finish. Purpose of ~2 inch wide flat panel flanking range? - Hello, I am curious if the ~2 inch wide flat panels flanking the range are solely for design purposes, or if this was intentional since the cornufe 110 range is 43'' and not a standard 48'' wide range? Was this element done with the intention of being able to install a standard US sized range at a later time if necessary by removing the flat panels flanking range? Please let me know, thank you! This kitchen is a small footprint and the range cabinet wall had to be a reduced depth, but we had to accommodate the depth of the range with the block columns on each side. love the cabinet doors. who are they by? Love this kitchen...what is used for the backsplash behind the stove? 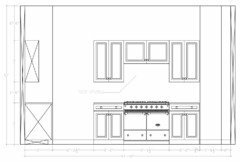 - This is my dream kitchen! Beautifully done. I live in a 1974 mobile home with the ugliest kitchen...looking for ideas. Thanks so much for sharing this project. Ha, we have all lived with an ugly kitchen but glad you found houzz.com to inspire you. We used a selection of tile from Tribeca. Outer Moulding is Harrison 1.5" x 8", Inner Field tile is Rhomboid Field 4" x 7" and the button details are Wexford Button by Walker Zanger - bronze finish. Vintage styling. 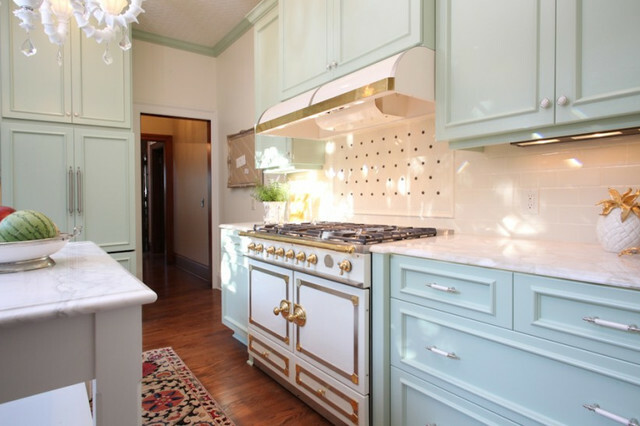 This French styling of the La Cornue range and hood is the true centerpiece of this gorgeous kitchen. Made of a painted cast iron and brass, the craftsmanship speaks to an earlier and more noble time. 3. Know thyself. If you just have to have that beautiful range that costs as much as a new luxury car, don't budget for the generic range from the local appliance store. Think about what you really want and how you really want to use the home you're creating, and make sure you've budgeted for it. 5. A stove and hood that a French chef would be proud of. Sure it's the cost of a small (or even a large) BMW, but why not? This stove by La Cornue, hand assembled and custom built to an owner's specification, has style, beauty and function all in one. 6. Stone mosaic backsplash. Reinforce the special nature of the cooking area with a backsplash that draws attention to it. There's nothing new about a white stove. But a white La Cornue French range with vintage-inspired gold knobs and details is worth a second glance. Pretty, isn't it?